Carpenters with coffin in the shape of a Coca Cola bottle. You can see more pictures at Ghana Web. 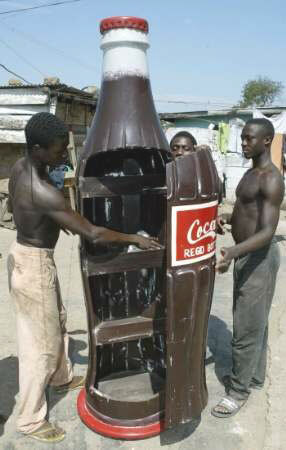 AFRICANS buy 36 billion bottles of Coke a year. Because the price is set so low—around 20-30 American cents, less than the price of the average newspaper—and because sales are so minutely analysed by Coca-Cola, the Coke bottle may be one of the continent’s best trackers of stability and prosperity. “We see political instability first because we go down as far as we can into the market,” says Alexander Cummings, head of Coca-Cola’s Africa division. The ups and downs during Kenya’s post-election violence this year could be traced in sales of Coke in Nairobi’s slums and in western Kenya’s villages. Events in the Middle East, such as the 2006 war between Hizbullah and Israel, can dent sales in Muslim parts of Africa, though anti-American feeling usually wears off quite quickly. At a macro-level, when Coke fails, the country whose market it is trying to penetrate usually fails too. Coca-Cola’s bottling plant in Eritrea hardly works because the country’s totalitarian government makes it impossible to import the needed syrup. The factory in Somalia sputtered on heroically during years of fighting but finally gave out when its sugar was pinched by pirates and its workers were held up by gunmen. Mr Cummings admits that Coca-Cola is “on life support” in Zimbabwe. Still, if Coca-Cola’s predictions are anything to go by, Africa’s future is mostly bright. The company expects sales in Africa to grow by an annual 10-13% over the next few years, handily outstripping economic growth. cc, great to see you on wordpress. Like the layout. I have gotta say: you have gotta be kidding me! Coke as an indicator? How reliable is that? Hi E.K. Bensah II, and thanks for dropping by! The coke indicator struck me as funny and odd too, but the article makes sense. Brilliant, and can you believe your blog post showed up before the Economist article when I searched for Coca-Cola’s activities in Somalia? Good job and thanks for posting, I’d never have found it otherwise. Thanks Elizabeth! That is very nice to hear. And I appreciate your interest.